2019 has started off strong for the Health Depot Association with a membership of 23,000 across the country – members committed to researching and managing their health and wellness for themselves and their families. Although healthcare continues to shift and change at a national level, Health Depot remains committed to providing industry-leading benefits and value for its members. To help our members better plan for the unexpected, we are pleased to announce new benefits and resources now available. Health Depot has partnered with AirMed International Air Transportation to provide Emergency Medical Air Transport on certain membership levels at no additional cost, to address medical emergencies that may happen while you are hours away from home. Also new in 2019, Guarantee Issued, Term Life Insurance benefits for the primary members are available on specific membership levels. This benefit is underwritten by Amalgamated Life Insurance Company and the primary member can choose coverage amounts of $15,000, $12,500, $10,000 or $5,000. To our members with families, we are excited to offer a new scholarship opportunity for the 2019-2020 scholastic year to help with continuing education. We will award up to three scholarships of $2,500 to eligible applicants, selected by Scholarship America, an independent administrator. Members with eligible dependents will be receiving an email from Health Depot with more details shortly on qualifications for the scholarship and how to apply. We appreciate your ongoing feedback regarding benefits and resources that you find valuable on your journey to managing your healthcare costs, as well as the support your Health Depot membership provides. With resources like Twitter, Facebook, Linked In and the newsletter, we want Health Depot members to stay informed as we continue to investigate new, competitive benefits and resources that work hard on your behalf. Thank you again for your continued support. Did you know that like your skin, your eyes are also sensitive to harmful UV rays. You might think UV is a concern only on bright, sunny days, but the facts might surprise you! Making a festive and elegant table for your holiday feast is a given, but consider using a variety of colorful vegetables and fruits to brighten up your spread as well. By adding sautéed red peppers, onions and mushrooms to bowls of green vegetables, you can introduce a splash of color and additional nutrients for your guests. Involve your young guests in helping to choose vegetables in a variety of colors at the store. By involving the children in these important decisions, they will feel a sense of pride and be more willing to try these new vegetables. Heart-healthy colorful veggies include sweet potatoes, Brussels sprouts and acorn squash. Apples and nuts are also healthful and provide texture and variety to any holiday spread. Enjoy creating a vibrant holiday feast for your loved ones this holiday season with a challenge to add as many colors as possible! 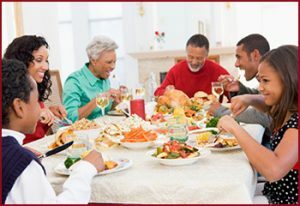 Be sure to visit the American Heart Association for ideas of how to add color and healthy recipes to your holiday table. Slips and falls aren't typically thought of as a serious risk to our health, but they can be deadly. 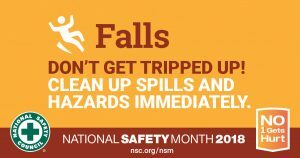 Falls are the third leading cause of unintentional injury-related deaths for all ages and the number one cause of death for those 65 and older, according to injuryfacts.nsc.org. The National Safety Council has provided some preventative that we can take to avoid falls and distracted walking. Remove clutter, including electrical cords and other tripping hazards from walkways, stairs and doorways. Install nightlights in the bathroom, hallways and other areas to prevent tripping and falls at night. Always wear proper footwear and clean up spills immediately. Place non-slip adhesive strips on stairs and non-skid mats in the shower and bathroom. For older adults, install grab bars near showers and toilets and install rails on both sides of stairs. Older adults can also take balance classes, get their vision and hearing checked each year and talk with their doctors and pharmacist about fall risks from medication. Today, nearly everyone has a cell phone and consequently distracted walking has become a serious risk. One study, published in the Journal of Safety Research, found that over a 10-year period, distracted walking was responsible for more than 10,000 serious injuries. Avoid cell phone use while walking, especially near crosswalks - talk with your friends and loved ones about this risk as well. Pay special attention in busy areas, such as airports and shopping centers, and even your own house - more than half of distracted walking incidents happen at home. Avoid other distracted walking risks, such as listening to headphones, when walking near intersections and other busy areas. When driving, look carefully for pedestrians distracted by their phones - slow down and pay special attention in school zones. Taking care of daily issues, household needs and pressing work deadlines seem to always take priority over taking care of ourselves. Making a conscious effort to focus on our own wellness is critical to our overall wellbeing and health. 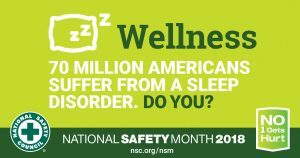 As part of National Safety Month, the National Security Council has provided some tips on how to improve wellness at every stage of life. Fatigue is more than just being tired. If you’re missing out on the recommended seven to nine hours of sleep each day, you could become sleep deprived and be at higher risk for the negative effects of fatigue. It is important to prepare for the unexpected because an emergency can happen at any time. 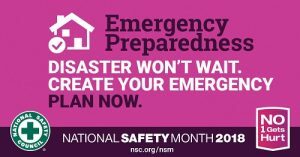 With the National Safety Council and in honor of National Safety Month in June, we have compiled some of the best tips and resources for preparation. Research, prepare for national disasters common to your area, such as floods, earthquakes or tornadoes. Stay informed during watches and warnings. Be sure to take advantage of special free and discounted offers during National Safety Month, sponsored by National Safety Council. Free First Aid Online Course June 1-10. Register here. Discount on Emergency Preparedness Course June 1-9. Learn more here. Family Safety & Health magazine discount. For more information on how you can be prepared in an emergency, be sure to review our previous blog on You are the Help Until Help Arrives. As the first quarter of 2018 comes to a close, we are pleased with the growth and progress of the Health Depot Association over the past year. Our membership has grown to more than 20,000 strong across the country – members all committed to managing their health and wellness for themselves and their families. In 2017, we had some members hit hard with Hurricanes Harvey and Irma. With donations to the American Red Cross and working with partners like Teladoc, we will continue to help support those affected by the recent hurricane and natural disasters as our members work to get their families safe and businesses growing again. Our focus will continue to be on our members and providing the highest level of satisfaction with their membership and the benefits that Health Depot provides. To provide more options and flexibility for our members, Health Depot created new membership levels and benefits for vision, dental and fixed-indemnity in 2017. We have also partnered with Pin Paws to create an affinity partner savings program for pet locating services. Additionally, through our newsletters, blog articles and social media community, our goal is to provide Health Depot members with timely and relevant content and resources to help as you research information and make decisions about health and wellness. The remainder of 2018 promises to be an exciting year for associations like Health Depot. With a new executive order signed by President Trump in October 2017, the country is providing a new focus on Association Health Plans and Short Term Limited Duration plans, which we hope will make new opportunities and benefits available to you through Health Depot. We are receiving regular updates regarding this news as it develops and will share information with you as we learn more. We are committed to researching industry-leading benefits and resources on your behalf so that you and your families have access to the health and wellness tools you need and look forward to continuing to serve you in 2018. March is National Nutrition Month, an education and information campaign created by the Academy of Nutrition and Dietetics. It has been proven that a combination of making good food choices and creating exercise habits can help provide a healthier life for you and your family. This year, the theme is to "Go Further with Food" and promotes the idea of starting with a healthy breakfast or fueling up with nutritious snacks before athletic activities as a great way to make your food work for your body and go further. Consider the foods you have on hand before buying more at the store. Buy only the amount that can be eaten or frozen within a few days and plan ways to use the leftovers later in the week. Continue to use good food safety practices. Find activities you enjoy and be physically active most days of the week. Realize the benefits of healthy eating by consulting with a registered dietitian nutritionist. RDNs can provide sound, easy-to-follow personalized nutrition advice to meet your lifestyle, preferences and health-related needs. Have you ever wondered about staying healthy while flying in an airplane and traveling to new destinations during the winter months? It can be tricky, given colder temperatures, more germs hanging around inside, and sharing the air in closed places. Tap water can be unsafe to drink, especially in foreign countries and can cause traveler’s diarrhea due to bacteria present in local water sources. Carbonated water with an intact seal can give you peace of mind. Hydration is important though – so enjoy your sparkling water as often as possible. Your immune fighting power begins in your gut, so boost up your probiotics. Forms that contain lactobacilli and bifidobacteria may help prevent G.I. disorders. Eat and drink wisely and avoid overindulgence which can impact your gut health while traveling. Don’t forget to bring an ample supply of medications. According to the FDA, many drugs sold in developing countries contain impure or toxic ingredients. Also, taking magnesium while traveling may help you get better sleep while traveling and also acts as a laxative - helpful when dealing with changing time zones, sleep patterns and diet during vacation. Airplanes are notorious for dry air – a potential problem for your immune system. Dry nasal membranes create a breeding ground for germs because the microscopic hairs in your nose that move germs through don’t work effectively when too dry. If you use a saline nasal spray or gel an hour before and after your flight, this may help prevent germs from traveling down into your throat or lungs. Enjoy your travels and stay healthy along the way! Amidst the beauty of the orange and red leaves there’s one other striking color that catches eyes every October, pink! The minute we see the ribbons, balloons and NFL football players’ gloves and cheerleaders shaking pink pompons we know it’s Breast Cancer Awareness month. But, breast cancer awareness month is more than just wearing a pink ribbon or article of clothing or joining in on a walk or fundraiser, it’s a reminder to make sure you’re taking the necessary precautions to take care of yourself and loved ones. In 2017, the American Cancer Society estimates there will be 252,710 new cases of invasive breast cancer. Regular mammograms increase your chances of finding cancers before the symptoms become present. Those with an increased risk because of age, genetics, etc. are recommended to have MRI screenings as well. Each year we see posts about how to do your own exams at home and early detection signs so instead of that we will give you some ways that you can join the fight against breast cancer. Get the Breast Health Guide - Visit the National Breast Cancer Foundation site and sign up for your free Breast Health Guide. Then, share the link with your friends and family. Become an Advocate - Stay up-to-date with legislative actions and current advocacy initiatives that support funding and treatment. Volunteer or Hold a Fundraiser - Many programs are available through Susan G. Komen and the National Breast Cancer Foundation to raise money to provide mammograms, support and education. Breast Cancer Awareness should be practiced year round but October is a special month in the fight. Celebrate the survivors and remember those whom lost the battle by wearing your pink this October. But remember, early detection is key in increasing survival rates. Set up your reminders and stay in-the-know with the latest research so you can make the right choices for you and your loved ones. Benefits Administration and Member Support for The Health Depot Association is provided by Premier Health Solutions. Premier Health Solutions, LLC markets and sells under the name PHSI Insurance Agency, LLC in California and under the name PremierHS, LLC in Kentucky, Ohio, Pennsylvania, South Carolina and Utah.